Below are the various forms as specified in the 2015 Edition of the UMVIM, SEJ Team Leader Handbook. This is a packet of forms that team leaders may need to use, depending on their team's situation. This packet includes: Medical Information and Release Form, Physician's Release Form, Parental Consent Form, and Team Member Evaluation. PLEASE NOTE: THESE FORMS ARE ONLY FOR THE TEAM LEADER AND DO NOT NEED TO BE SENT TO OUR OFFICE. Suggestions for determining the overall cost of your domestic mission journey. Use for determining what parts of your mission are tax deductible. These questions can be used in conjunction with the application to help build your team. 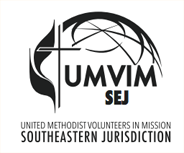 UMVIM, SEJ provides these general guidelines for your information. Your team is expected to follow your annual conference’s Safe Sanctuaries policy. Use this template as a guide for individual and church-wide fundraising efforts. In addition to personal items, some of these may be helpful to the team as a whole. This is a suggestive checklist for individuals on your team, however this can vary according to destination. Team Members will receive a Missioner Profile to fill out via email from our office, but if the Team Leader would like this information for his or her records, this form can be modified and used. Discuss with your host the level of medical facilities available, and adjust this list accordingly. Please have your team members fill out this form and send to our office upon returning home. Please fill out this form and send to our office upon returning home.